An SNMP trap allows a network device to contact the network management when there is a significant event. This is done via unsolicited SNMP messages. For example, if a UPS is out of power, an SNMP trap will be sent to the network administrator's computer with the message, "Out of power." A door sensor can send messages when the door is open. The SNMP Trap allows the manager to be notified when there is a problem so he can respond to it quickly without having to manually check everything to see what the error is. The program can receive such SNMP messages (SNMP traps) and alert a network administrator about them using a variety of methods. To enable the SNMP traps receiving function, select the "SNMP | SNMP traps" menu item. 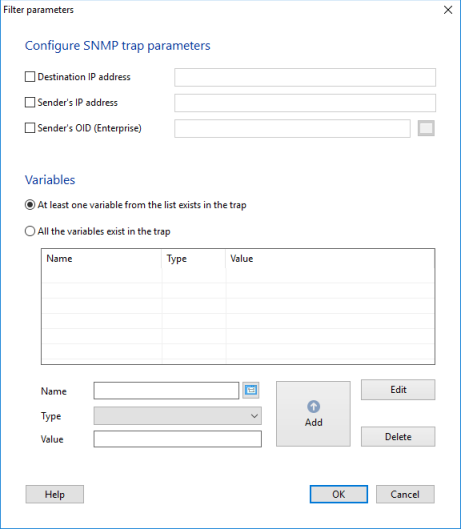 On the SNMP trap window, you can configure whether the program should Receive all SNMP traps or Receive SNMP traps satisfying filters (and configure these filters). Here, you can also change the SNMP trap receiving Port. The default SNMP port is UDP 162. If there are many devices sending SNMP traps on your network, you can configure a trap filter which will allow you to filter our unnecessary and unimportant messages. 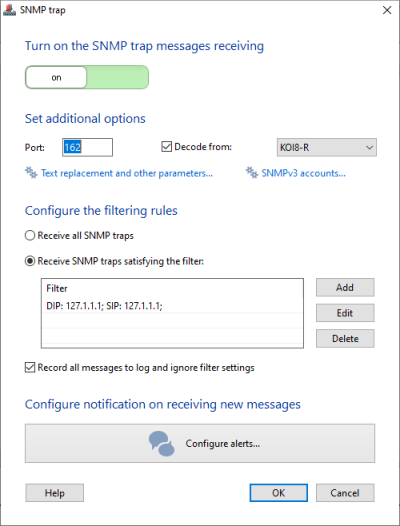 To configure a filter, select the Receive SNMP traps satisfying the filter option and click Add. For example, to receive traps from only one host you can select the Sender's IP address option and define the host's IP address. In the same way, you can configure the program to receive SNMP traps sent to your computer only using the Destination IP address option. 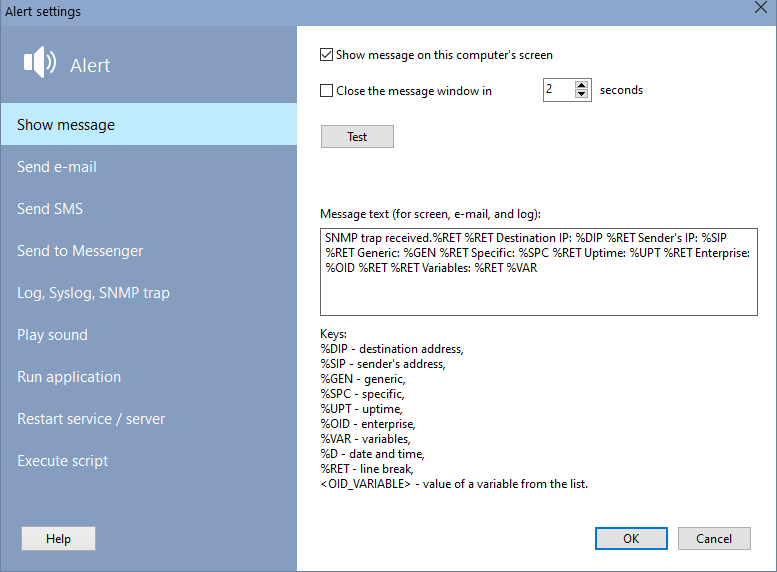 An SNMP trap message contains structured information including an SNMP variable name (OID) and its value. You can configure the program to receive SNMP traps with some certain variables only. Add the necessary variable names to the list. You can also configure the variable type and necessary value (optional settings). After filling in the variable parameters, click Add to place the parameters to the list of variables. After configuring the necessary variables, the program will search for them in all the received SNMP traps and notify you if the variables contain in the traps. To configure notification methods for SNMP traps, click the Configure alerts... button below filters on the SNMP Trap window (See Fig. 1). After enabling the SNMP trap receiving, you can close these windows. The program will continue receiving SNMP traps and notifying you in the background mode.